Bob Marshall hiked to Turquoise Lake on September 3rd, 1928. So it only makes sense you channel your inner Bob and take advantage of the long weekend with this difficult but exciting hike! In a giant bathtub of rock walls, you’ll talk of this hike for years. h Seeley until you reach Kraft Creek Road (located between mile markers 37 and 38.) Follow Kraft Creek Road for 11.5 miles to the trailhead. What to expect: Turquoise Lake is a deep 18-acre lake in the Mission Mountain Wilderness Area. The climb is nice and steady with compelling views and tempting huckleberries to help you forget about the miles and elevation gain. You’ll start out following Glacier Creek and in less than a half mile you’ll cross Crazy Horse Creek and then Crescent Creek after that. Both creek crossings have log bridges with handrails, but can be slick early in the season from water splashing over the bridges.After almost 1.5 miles from the trailhead you’ll reach a trail junction. Take the trail towards Crescent, Heart, and Turquoise Lakes. The next couple of miles is often huckleberry heaven! In just under 3 miles from the trailhead you’ll reach trail junction. 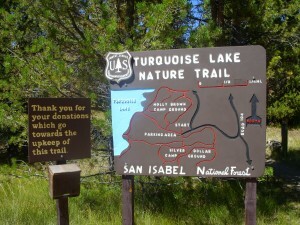 Stay on the trail #708 towards Turquoise – do not turn towards Crescent and Heart lakes. The views become steadily more graphic from this point on. About 5.5 miles from the trailhead you’ll come to Lagoon Lake, and then Turquoise Lake is about a third of a mile after that. Let the sound of the rushing water lead the way! After you reach Turquoise Lake you’ll be tempted to explore the rock slabs surrounding the lake. 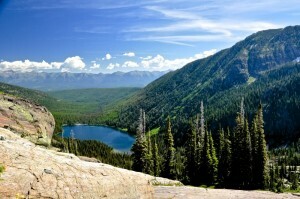 If you climb about 500 feet up from the south end of Turquoise Lake you’ll enjoy a speculator view of McDonald Peak, the highest point in the Missions. Tip: This hike can be completed in six hours, but most people take 8 hours or more to enjoy what many will call their favorite hike. Big thanks to Bretz RV & Marine for sponsoring the Trail Well Traveled! Whether you are looking for a travel trailer, motorhome, fifth wheel, toy hauler or boat you will get the best deal at Bretz RV & Marine, 4800 Grant Creek Road or 541-4800!